October 12, 1904 is a landmark day in Pulp history... it's the day that Lester Dent was born. Dent was the pulp-fiction author, who the superhuman scientist and adventurer Doc Savage. Savage appeared in over 181 novels written over 16 years. Born in 1904 in La Plata, Missouri, Dent was the only child of Bernard Dent, a rancher, and Alice Norfolk, a teacher. Dent’s family returned to Wyoming in 1906, working a ranch near Pumpkin Buttes, Wyoming. Dent attended a local one-room school house, often paying for tuition with furs that he had caught. Around 1919, the Dents returned to La Plata, where Dent's father took up dairy farming. Dent completed his elementary and secondary education there. In 1923, Dent enrolled in the Chillicothe Business College in Missouri, eventually picking a major in telegraphy. In 1924, Dent became a telegraph operator for Western Union in Carrollton, Missouri. In 1925, he moved to Ponca City, Oklahoma, working as a telegrapher for Empire Oil and Gas Company. Dent married Norma Gerling on August 9, 1925. In 1926, the Dent moved to Chickasha, Oklahoma, working as a telegrapher for the Associated Press. Dent's first professional writing sale was entitled "Pirate Cay", and appeared in the September 1929 issue of Top Notch magazine. Shortly after, Dent was contacted by Dell Publishing in New York City who were willing to pay him $500 a month to write exclusively for their magazines. Dent relocated to New York in January 1, 1931 and quickly learned the trade of the pulp author. In 1932, Henry Ralston of Street and Smith Publications hired Dent for a new publication, following the success of the The Shadow magazine. Dent received $500 per novel, although they were published under the house name Kenneth Robeson. Issue Number 1 of Doc Savage debuted in February 1933, quickly becoming one of the top-selling pulp magazines. Over the next few years, Dent continued to study and learn new skills: he took courses in technology and the trades, earning both his amateur radio and pilot license, and was an avid mountain climber. In May 1934, Dent bought a 40-foot two-masted Chesapeake Bay "bugeye" schooner, Albatross that he and his wife lived on for several years, sailing up and down the eastern seaboard and even doing some sunken-treasure hunting in the Caribbean, before selling it in 1940. Dent returned to La Plata for good in 1940, where he continued to write Doc Savage and other genres. Doc Savage Magazine ceased publication in 1949. Of the 181 Doc Savage novels published by Street and Smith, all but twenty were written by Dent. Dent suffered a heart attack in February 1959. He was hospitalized, but died on March 11, 1959. Dent is buried in the La Plata cemetery. Currently one of two of the authors working with Graphic Pulp, Glenn Porzig grew up reading comics, pulp novels, and watching too much TV. He lives in southern Indiana with his wife and a menagerie of both furry and scaly pets. Since 2005, when not writing, xboxxing, or spending time with his wife, he's also been the co-host of PodCulture.com, a weekly fandom podcast. Glenn has worked over twenty years in the television industry including two highly rated specials for SCI FI Channel; The Roswell Crash: Startling New Evidence, and The New Roswell: Kecksburg Exposed. He currently, literally, has his head in the clouds as a videographer on a TV news helicopter. For the past several years, Glenn turned from writing screenplays with his wife to writing short stories and novellas. Glenn's first short story, Master of the Dead, was published by Destroyer Books in More Blood: A Sinanju Anthology. 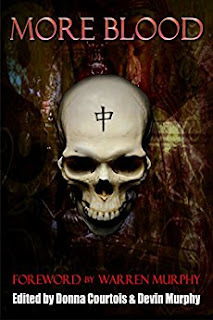 His debut occult horror novella, Darkness Unbound: Lady in Black, was released the summer of 2014, and was later brought to life as an audiobook by Scream Queen Brinke Stevens. Glenn has gone on to pen to more installments in the Darkness Unbund series: Terror of Night, and Shadow of Death , both of which are also available on audio. Glenn is currently working on a fourth Darkness story, and has two more installments on the way. You can learn more about his writing projects at DarknessUnbound.com. If you're an indie author, you know how hard promoting your work can be. For two Midwest Indies with a love of Pulp, Horror, and Men's Adventure, and who happened to be cousins, a simple solution came to mind: cross promote each other. Few people enjoy sitting at a table at a show all day. I mean, you'd rather be walking around, seeing what a show has to offer, right? If only there was someone you could get to sit there for you? Or what if you can't make it to a show, because of other commitments? No problem, just get someone to take some of your books to the show for you, and you'll reciprocate in the future. That's what Graphic Pulp is--a small group of authors, cross-promoting modern Pulp in the Midwest, and beyond. Starting tomorrow, you can learn a little bit about our authors, with a weekly intro on who we are, what we write, what we're working on, and where we might be showing up. We'll also talk about what we love in the Pulp, Men's Adventure, and Horror genres, old and new, and we might just scrounge up some interviews with authors we've met around the world. A new source for Pulp, Horror and Men's Adventure! Welcome to the Graphic Pulp Blog--your first stop for news from the Graphic Pulp line of action and adventure stories. What is Graphic Pulp? It's a cooperative venture between independent authors to produce new content on a monthly basis for lovers of two-fisted literary action. Each author in Graphic Pulp works on their own projects bypassing the dinosaurs of traditional publishing to write new adventures and release them in a fraction of the time readers are used to. Graphic Pulp means big adventure, on a regular basis, quickly. Horror has been around for along time, from the days of Mary Shelley and HP Lovecraft up through the master of modern terror, Stephen King. Horror novels thrill readers through fear and maybe a few buckets of blood here and there. Monsters, madmen and even magic reign supreme in Horror, and mankind often isn't enough to stand against it. Graphic Pulp's authors combine the best of these three genres to craft tales of over-the-top action. Enjoy the ride!